Even if you're not really that into science, you have to appreciate a good chain reaction, unless you're an exec at 20th Century Fox, in which case, just throw Keanu Reeves in it, and go back to counting your sweet Star Wars money. Creating digital chain reactions for you like it's their job, If This Then That, now in beta. Imagined by two dudes who used to work for the firm that designed the first-ever Apple computer mouse (Ahhhh!!! 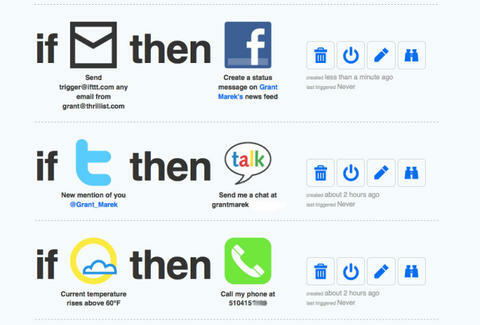 ), IFTTT is a new free web service that attempts to automate everything on the Internet, creating life-improving cross-platform tasks that'll save you the trouble of copying & pasting your pithy comment about Most Eligible Dallas onto every one of your social media channels. Connecting almost three dozen digital services (Facebook, Tumblr, Gmail...) and phone functions (SMS, phone calls, etc. ), the service follows a simple "if"-"then" formula, like if "Teenage Mutant Ninja Turtles" are mentioned on Google Reader then you get a text, or if "Donatello" checks in on Foursquare at your house then it's time to "does machines". The service'll hand-hold you through setting up a task (you can have up to 10 running at once), then it'll auto-scan the Internet every 15mins for one of your triggers (like "it's over 80 degrees in San Francisco"); once it finds one it runs pre-programmed code developed in their Hayes Valley apartment to complete your desired action (leave voicemail reminder to "wear jorts"). As of right now, there're already almost 4000 combinations, a number that'll continue to increase thanks to a feedback option that lets you suggest new functionality and digital channels worth adding, just as long as said channels don't run a certain fictionalized account of the US government's attempt to prevent the spread of bubble fusion technology. Oh Keanu!